Easily one of the most popular and beautifully rendered parks in Texas and beyond, 6,500+-acre Bastrop State Park revolves around the "Lost Pines" of central Texas, a seventy-square-mile western outlier of pine and oak woodland. The 200-strong CCC Company 1805 arrived in 1933, and the 200 enrollees of Company 1811 arrived in 1934. While the men worked hard to leave the impression that their efforts had little impact on the natural resources of the area, the workers did harvest Bastrop County timber and quarried nearby sandstone to construct the park's many rustic style structures. Architect Arthur Fehr, who directed most of the CCC work at the park, embraced the design principles of the National Park Service, which emphasized harmony with the surrounding landscape. 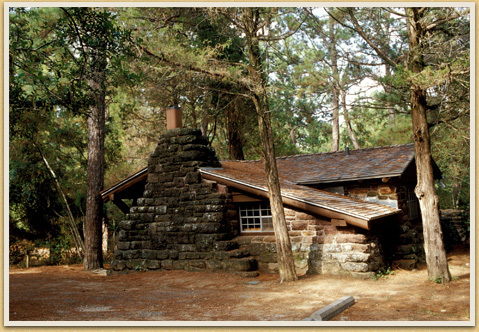 The superb walnut, oak, cedar, and pine woodwork on the refectory, including a massive beamed ceiling, plus the twelve distinctive indigenous cabins artfully nestled within the park's loblolly pine forest enhance, rather than compete with, the natural setting. Two other depression-era groups, the National Youth Administration and the Works Progress Administration, contributed to the park’s many features and structures. The NYA built and used the maintenance building in 1940 to construct furniture and fittings for CCC parks in Texas, including Bastrop. The WPA built both the swimming pool and the original nine-hole golf course as separate projects under the auspices of the State Parks Board. The dam and lake predate the park. Entrance Portal, Park Road 1, Stone Curbing, Fencing, Culverts, Vehicle and Foot Bridges, Two Scenic Overlooks, Stone Tables and Seats, Picnic Firepits, Amphitheater, Campground Shelter, Water Fountains, Refectory, Group Picnic Pavilion, Custodian’s Dwelling (currently a cabin), Helper’s Quarters, Group Latrine (later a cabin, currently storage), Twelve Cabins, Golf Pro Shop and associated Golf Shop (currently the “Caddyshack” and storage), Restrooms, and Pump House (no longer in use). The Keeper’s Residence and Storage were designed but not built. The Swimming Pool, Bath House, and Pool Shelter are the work of the WPA; the original Maintenance Building was built by the CCC and later modified by NYA (currently the State Parks Sign Shop).